Our group is well-versed in the dual theoretical and experimental approach necessary in the field of electrocatalysis. Our work focuses on understanding how selectively tuning the properties of metal surfaces can improve their catalytic activity. After identifying key design parameters, we can develop structure-property relationships that predict the activity of novel catalytic materials. We have investigated the oxygen reduction reaction (ORR) which occurs at the cathode of hydrogen fuel cells. The ORR is the primary source of efficiency losses in low-temperature hydrogen fuel cells. To achieve adequate performance, high loadings of expensive platinum catalysts are required which coincide with high costs for hydrogen fuel cells. Our goal is to design cheaper, more active electrocatalysts for ORR. Using the binding energy of surface hydroxyl (OH) groups as a chemical descriptor for surface reactivity, we have developed a model that allows us to accurately predict adsorption energy on multimetallic surfaces. The precision of the model was assessed using density functional theory calculations. With this model, we have identified a number of alloy nanostructures that are predicted to have higher ORR activity compared to Pt standards. The predictions from this model will guide future experiments. Current members working in this area include Sean Dix and Jacques Esterhuizen. Synthesis of well-defined multimetallic nanostructures is critical in discovering catalysts to replace platinum for the electrochemical oxygen reduction reaction. 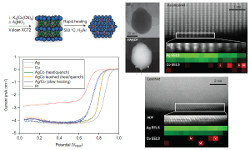 The synthesis of these nanostructures is often complicated by incompatibility of metals, dynamic reconstruction under operating conditions, and general characterization of the nanoparticles. Recently, we developed a synthesis in which we encountered and overcame these obstacles. We worked on improving alkaline ORR activity of Ag-based materials. While silver is less active material than Pt, it is also much less expensive. By improving the ORR activity of silver through alloying, we can make materials that are more competitive with Pt on a cost basis. 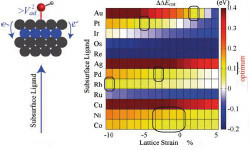 Motivated by density functional theory calculations, we developed a synthesis to prepare Ag-Co nanoparticles that show superior ORR performance compared to monometallic Ag nanoparticles. Current members working in this area include Sean Dix. Electrochemical oxygen reduction reaction on Ag nanoparticles of different shapes. A. Holewinski, J. Idrobo, S. Linic. Nature Chemistry, 6, 828-834, 2014. A. Holewinski, S. Linic, J. Electrochem. Soc., 159, H864, 2012. E. Nikolla, J. Schwank, S. Linic, J. Electrochem. Soc., 156, B1312, 2009. J. Mukherjee, S. Linic, J. Electrochem. Soc., 154, B919, 2007.